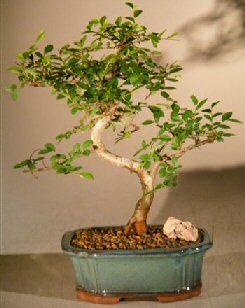 Hardy with small evergreen leaves and excellent branching characteristics. Trained in the traditional curved trunk style. 6 years old, approximately 13" tall. Recommended indoor bonsai tree, grown and trained by Bonsai Boy. Suitable humidity/drip tray is recommended. To purchase add $7.95.